Be the first to share your favorite memory, photo or story of Jeannette. This memorial page is dedicated for family, friends and future generations to celebrate the life of their loved one. 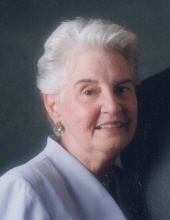 Jeannette V. Beelen, age 91, of McHenry, passed away Thursday, April 11, 2019 at her daughter’s home surrounded by her loving family. Jeannette was born May 14, 1927 in Bronx, New York to Edward and Helen (Springhorn) Hyland. She attended Sullivan High School in Chicago and after she married the love of her life, Robert Beelen on September 16, 1946. Jeannette was a longtime resident of Skokie, and then lived in Richmond for a few years before moving to McHenry in 2000. She enjoyed working for many years for Baxter Labs manufacturing medical devices before retiring at age 55. She loved to read, work crossword puzzles, garden and enjoyed music, especially Frank Sinatra and other crooners. Jeannette was a very loving mom and a doting grandma, family time together were her most valued treasure. Jeannette is survived by her four children, Edward (Deborah) Beelen, Robert J. (Mary) Beelen, William Beelen, Barbara (Robert) Beelen Kalman; seven grandchildren, Jessica (Owen) Karner, Vanessa (Nathan) Ranke, Robert (Abby) Beelen, Brett Beelen, Jennifer Allie, Tracy (Valentine) Hernandez, Jennifer (Matthew) Berning; thirteen great-grandchildren, Mason, Ryan, Grace, Samantha, Colin, Paisley, Jacob, Jackson, Mary, Patrick, Maggie, Brendan, and Meghan; also, two nephews, Terry Hyland, and James Hyland. She was preceded in death by her parents; husband, Robert Beelen; a sister, Helen Hyland; and a brother, Terry Hyland. Visitation will be from 2 p.m. until the 4 p.m. Funeral Blessing on Monday, April 15, 2019 at Thompson Spring Grove Funeral Home, 8103 Wilmot Road, Spring Grove, IL 60081. Inurnment will be in Saint Joseph Cemetery, Richmond. To send flowers or a remembrance gift to the family of Jeannette V. Beelen, please visit our Tribute Store. "Email Address" would like to share the life celebration of Jeannette V. Beelen. Click on the "link" to go to share a favorite memory or leave a condolence message for the family.